Mother Nature uses hydroxyl molecules to cleanse and decontaminate our outdoor environment. However, hydroxyls do not occur indoors, so HGI developed a patented process, through years of field testing, and created a solution that mimics Mother Nature by safely generating molecules that naturally "seek and destroy" odor molecules, bacteria, viruses, VOCs, and other chemicals. Hydroxyls actually neutralize odor molecules and gasses by breaking down their chemical bonds. This can be done with even some of the most difficult molecules, such as hydrogen sulfide (H2S) and ammonia (NH3). Hydroxyls (HO•) are naturally occurring molecules. They are created in our atmosphere when the sun's ultraviolet rays react with water vapor in the air. Hydroxyls are an important agent that scrub and cleanse our planet's environment. ODOROX® Hydroxyl Generators replicate this natural process. The ODOROX® system utilizes patented technologies that for the first time harness multiple UV light wavelength ranges. These wavelengths combined with ambient air humidity create hydroxyls. The ODOROX® hydroxyl generator is a revolutionary device that generates “superior hydroxyls” that eliminate bacteria, mildew, mold, noxious gases, odors and volatile organic compounds (VOCs) in indoor environments. 1. The processing chamber sanitizes airflow and produces hydroxyls (HO•). 2. 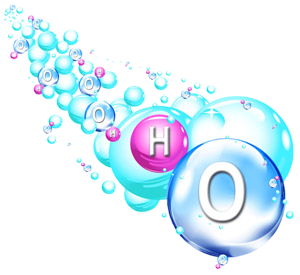 The hydroxyl (HO•) molecules exit the chamber to decontaminate surfaces and contents. Contaminated air is directed into the chamber where ambient humidity and multiple nanometer wavelengths and frequencies combine to create an oxidizing formula and produce hydroxyls. The quartz crystal optics are finely tuned to deodorize air flow, eradicate bacteria and other micro-organisms, as well as produce hydroxyl molecules. The purified air is recycled back into the environment along with hydroxyls to further decontaminate surfaces & contents. Once the hydroxyls are created, they are sent to "seek and destroy" odor molecules, bacteria, viruses, mold, VOCs and other chemicals. The hydroxyls simultaneously decontaminate the air, surfaces, and objects. This system does not require all of the contaminants within a room to pass through the processing chamber, which guarantees a more effective and rapid decontamination. Outside the unit the hydroxyls immediately begin a cascade reaction in the air, thus creating even more hydroxyls. The cascade of hydroxyls quickly disperse throughout the air and penetrates surfaces and objects. The hydroxyl molecule that eliminates pollutants in the far corner of the room is not necessarily the same hydroxyl molecule that exited the ODOROX® hydroxyl generator. Any quenched hydroxyls are continuously replaced by the system, providing a constant flow of hydroxyls. ODOROX® hydroxyl generators produce atmospheric hydroxyls that circulate throughout the air and reach places that otherwise can’t be reached. Other UV technologies only clean the air that passes over the UV bulbs (about 20% of the air in a room). It allows hydroxyls to penetrate into fabrics, porous materials and anywhere air molecules can reach. It cleans the air and all surfaces in contained spaces. It produces atmospheric hydroxyls strong enough to neutralize viruses and bacteria.